Raimi Merritt looks to defend her title in the International World Wakeboard Federation championship, taking place in South Korea from Wednesday to Sunday. Raimi Merritt had been back in the water only a couple of weeks after fracturing her ankle in a competition in May, and clearly the six-time world champion was not up to her usual form. 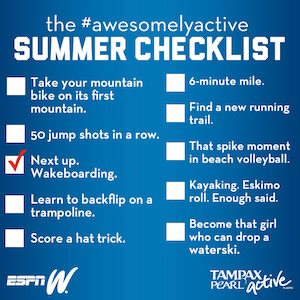 But with the World Wakeboard Association Championships in Kenosha, Wis., beckoning, that hardly mattered. "Even though she might not have been ready to ski, she really thought she was going to win," her father, Steve, marveled last week. "She's just not going to accept anything less." Merritt, who will attempt to defend another world title starting next week as she travels with the U.S. team to South Korea for the International World Wakeboard Federation championship, did not make the final round in Kenosha. But her father was familiar with the attitude. A world champion in barefoot water skiing, Steve Merritt had all four of his and wife Gina's children on skis at an early age -- Raimi as a 4-year-old practicing on the beach before he put her behind a boat. But by the time Raimi was 11, he had entered her in her first national competition. He wasn't sure what to expect of his youngest daughter. "She didn't know anybody, but she didn't care," he recalled. "She'd go out to the end of the dock and couldn't wait to compete. And she ended up winning." Raimi has barely stopped since she turned pro at 15 and moved to Orlando from the family's South Florida home to live with her then-19-year-old sister, Mia. Today, at age 20, Raimi is considered the face of wakeboarding. Her dad remembers calling the sport "skurfing." "I remember guys coming to boat shows in the late '80s and saying, 'I'm a wakeboarder,'" and everyone would chuckle. No one even knew what it was," Steve said. "But it changed the whole sport of skiing. The boat Raimi uses costs $130,000, and they're always sold out. While they might sell 50 ski boats, at most, they sell hundreds and hundreds of wakeboard boats now." "And now," said Emily Copeland Durham, a former national and world champion as well as an X Games gold medalist, "not only are boat companies selling boats but cable parks [where wakeboarding is done not with a boat but with cables] are going up everywhere and making it more accessible to everyone." Raimi, who was home-schooled as a child with skiing as "one of our school activities," remembers the sport simply "clicking." She wanted to live up to the potential she knew she had. "It was when I got older that I realized how good my dad was and what a name he made for himself in the sport, and I wanted to live up to the name," she said. "I also saw my dad's passion for it, and it made me have passion for it in the same way. "It's fortunate he could pass that on to me. It's just really cool that I could kind of continue doing the same thing." Like snowboarding, wakeboarding is an X Games event, an extreme sport predicated on high-flying spins and flips. "We want to have the biggest wakes, go huge, hit kickers [jumps] and sliders [a rail bar], do different stuff," Raimi said. In the process, she has suffered a torn biceps, a dislocated kneecap and two broken ankles but considers herself "fortunate" that she has never had to undergo surgery. Her coach, former pro wakeboarder Glen Fletcher calls her "a multitime world champion with a great, hardworking reputation" who has elevated the sport. "The other girls all had to step up because Raimi was just sweeping it for years," Fletcher said. "To keep up with Raimi, they all had to turn up their games." "Her goal when she got into the sport," Steve recalled, "was not just to win but to actually change the sport, so she has elevated every rider to step up. It is very competitive right now, and she is one of the main reasons why." Copeland Durham, a 15-year veteran on the pro tour and mother of a 3-year-old daughter, said Raimi's risk-taking tricks in particular have rubbed off on the other competitors. "It sounds bad, but I always said Raimi rode like more of the guys, but that's a good thing for us," Durham said. "She's always pushing the sport, she's always going big ... and I think it just pushes everyone. The other girls think, 'I can do that, too.'" As for the danger element, Raimi is like other risk-taking performers. "You can get hurt crossing the street," she said. "What drives people to the sport is because they like that feeling -- not like you could die -- but that rush. That's what pushes me." Her signature move is called an S-bend, a trick Fletcher describes as "looking like Superman with his arms extended out front and rolling all the way in the air. You're coming into the wake, and it's incredibly hard because of the way the rotation works," he said. "You have to have a huge amount of height and speed, and it's one of those tricks where either you get it or you get destroyed and you're done for the day. "It's a 100 percent commitment trick." Indeed, Merritt is 100 percent committed. But she also has a gift, her father and her coach said, that can't be taught. "Coaches would tell me, 'She was falling all week but when she goes to tournaments, she doesn't get her hair wet,'" Steve said. "When she goes to a competition, she loves the adrenaline. She doesn't get nervous. She just lands everything she has to land." Fletcher described that "inner gear" at work before the WWA Championships in Kenosha. "She probably shouldn't be riding on that ankle, but her pain tolerance is so high and she wants to go so badly," he said. "One day, she couldn't find tape for her ankle and she used duct tape. I said, 'Raimi, that's duct tape,' and she said, 'Just start the boat.'"